Hi! My name is Shelbylynn Gill and I am a 21 year old from Grand Falls-Windsor, NL. I am currently studying at Memorial University in St.John's majoring in Business Administrative and minoring in psychology. I am thrilled to have this opportunity to be working for Youth Centres Canada. I'm excited to learn about the power of youth centres and the great impact they have for our youth. Phone: 1 800-429-6615 ext 704 Hello! My name is Morgan Girvan and I’m a 23-year-old Business Management student from Grand Falls-Windsor, NL, currently pursuing a career in human resources at the College of the North Atlantic. 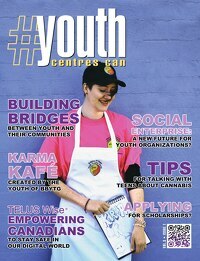 I’m delighted to have started my very first position with Youth Centres Canada as content editor! My training has helped me to develop a skill set in dealing with and helping people, so I’m really looking forward to putting those skills to good use by lending a hand in servicing the youth of our nation through this organization. I can already tell that this is going to be an amazing experience for me and I hope that my presence in YCC will be equally beneficial to my collogues and community alike!